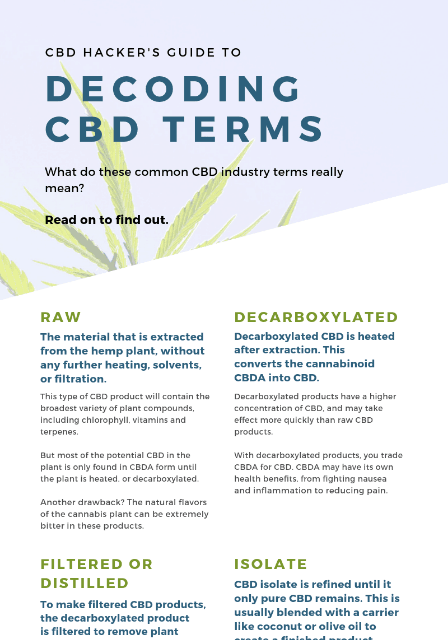 We created an infographic to help decode the most common terms used in the CBD industry. CBD Hacker’s mission is to introduce the transparency and quality information into an unregulated and often confusing industry. We aim to be the most comprehensive source for product review and other information about CBD. The rapidly growing world of CBD is still murky and very confusing for many people. This is in part due to the unique jargon that is used to describe CBD products. This includes terms like "raw," "decarboxylated," "distilled," "isolate," broad spectrum," and many more. It is important to know that not all CBD oils are created the same.